For some reason, I always associate traveling with a fleet of backpacks as something that belongs to my days as a student. Besides, dragging around more than one backpacks at any time is just clumsy. To feel like that I've truly left those days behind, I've been slowly expanding my luggage collection. I already own a large Delsey suitcase in blue grey for week-long trips and a carry-on size upright Benetton suitcase in lime green. They are both very practical and so easy to spot out in a sea of black. However, with the increased number of weekend trips that I make, I find that I really need a good overnight bag. For my weekend trips, I usually travel with my skate backpack containing all my skating essentials. However, I also need a seperate bag for all my non-skating belongings such as street clothes, pajamas, shoes, and toileteries. Luckily, I found my perfect bag at Lululemon yesterday. Their Activa gym bag is now on sale at $49 for selected colours so I quickly snapped one up. 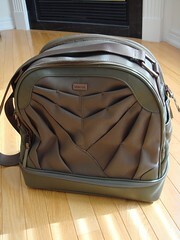 It is roomy, sturdy, and stylish yet it is still a good size for carry-on luggage. What I love most about this bag is the seperate shoe compartment at the bottom of the bag (a girl can't wear running shoes for every outfit after all). The inside of the bag is lined with easy-to-clean material. I can fit a water bottle on both sides of the bag and I can slip my phone or camera in the hidden front pocket for easy access. Now I can't wait until my next weekend trip so I can start packing!